Developed during years of experience in the fields of construction, mining, sewage and civil works. The Powley range of automatic vacuum-primed centrifugal pumps are known for their on-site reliability, ease of operation and maintenance. The UVO200 utilizes the one piece Powley Vacuum Pressure Seal. This tank cools the circulated oil, cooling the vacuum pump on high vacuum applications without seizing the rotor or bearings. 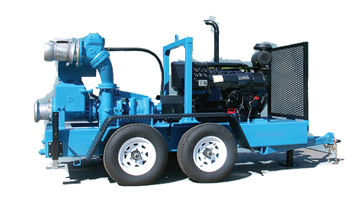 applications including wellpoint dewatering and sewage overpumping. The Powley priming sump has a capacity of over 25 gallons, making the separation highly efficient. Due to the large surface area of the sump, the velocity of the water and air entering the pump chamber is slowed down considerably, which decreases turbulence, enabling the float gear to last longer before service is required. The UVO200 ’s non-return valve is a solid non-clog ball and seal, designed for easy maintenance, and the passing of large solids.